Pete has been working in Early Years settings since the mid 90s. During this time he has built up a vast repertoire of short songs, activities and music games. 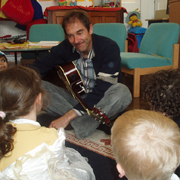 He works regularly as 'Musician in Residence' at Sandbank and Alumwell Nurseries in Walsall helping children to explore different ways of making music and using their imagination as a starting point for creative sessions.